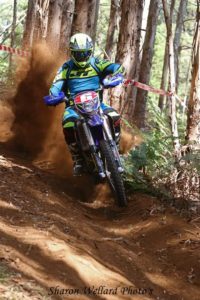 Favourite place to ride: Tasmania! Sam Dolbel had a great first year (2016) using Shinko tyres, you can follow his progress of the upcoming year and attack on the A4DE if you follow him on Instagram @samdolbel_ or on our blog page. 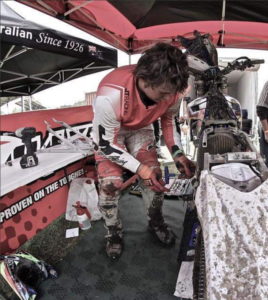 The race reports give you a great insight in to what a rider experiences over a race weekend and these are Sam’s words. Last Sunday we had a local event being a 4hour pony express. I decided to ride this race on my own as there’s extra points for doing it solo. We’ve had a lot of rain down here in Tasmania and all tracks are super wet and slippery! Been battling with a virus lately with not being able to eat for a bit over two weeks and sleeping very little. The night before racing I tried to eat but threw it up within 5 minutes. Had mixed emotions going on in my head because of this, thinking myself and body will struggle but also super keen to race in the mud. So, race day I got off to a good start. Pulled holeshot then took a wrong turn on the track. Was sitting third for 3/4 of lap one, till I had a small crash. Got up and went to start my bike but had no power, also having no kick starter I was stuck. Tried finding a fault losing time doing this. Found my cable to my battery snapped near the terminal. Had to do a dodgy repair and get going. Surprisingly it lasted 4hours! After lap 1 I was 41st. Second lap I started making up time then my chain jumped off 3 times with in the last 10 minutes of the track! Pulled in and got fuelled up and my chain tightened. Then went back out with some anger after some bad luck. Put my head down and started making up ground, making a lot of passes. By the last lap, I had moved myself back into 5th outright and that’s where I finished. Was good to get good valuable championship points and with only two rounds to go we hope to finish off strong. Then attack the A4DE! Last weekend was our final club race for the season. Consisting of an 8hour enduro. Running a bit of a s#%t show the week leading up to it I had a brand-new bike that I was only able to put 1-hour on before the race. A whole new bike for me being a 4 stroke after being on a 2 stroke for 10 years (I think). The change is different but I think it’s a good one for me. I used Shinko 546 tyres front and rear and they didn’t disappoint. Getting me off to a great start pulling the holeshot. Track was unreal and extra fun racing with a partner. By lap 3 we were sitting 5th and 5th is where we sat all day and that’s where we finished after a long hard slog on the bike. We were up against strong competition and this was a respectable result giving me a 6th place for the ironman series. Now onto the A4DE which starts in a weeks’ time! Keen is an understatement! Well the 2016 A4DE is done and dusted, literally dusted. The conditions in Mansfield were far from perfect. 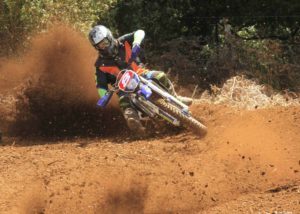 Riding in 30degree heat and bull dust every day it was far from my favourite 4day! Being my second 4day I found the event less stressful this time round. I went into the event with good preparation before I got to Mansfield and even when I was there. Walking each stage twice and some even three times before racing got underway. Prologue day soon rolled around. We had a good prologue with one or two little mistakes, placing in at 38th outright. Day 1 of the event I spent more time on the ground than the bike it felt like. With one being a big crash hurting my back. Day 2 was much better. Not having any crashes, I picked up a lot of lost positions from day 1. Pulling top 30 in 8 out of the 9 tests. Day 3 was similar. No crashes and good riding. Day 4 final moto was super dusty. Track was horrible to say the least. 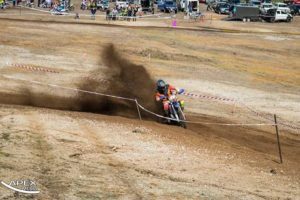 I knew the holeshot was key and I set my head to it. I pulled holeshot in a full grid and led all first lap and led the 2nd lap. Then made a little mistake and lost the lead. Lost a couple more places in the 20 minute moto. 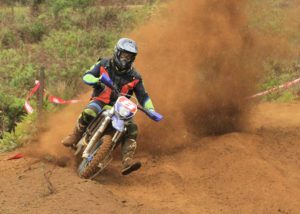 Finishing 4th in my final moto. This year’s result was respectable I believe with 47th outright. I’m hoping to return next year and give another attempt and better myself after knowing I’ve got good speed with placing top 20 in a few tests over the weeks racing. Doing oil changes every day my bike ran perfect, using pro plus. 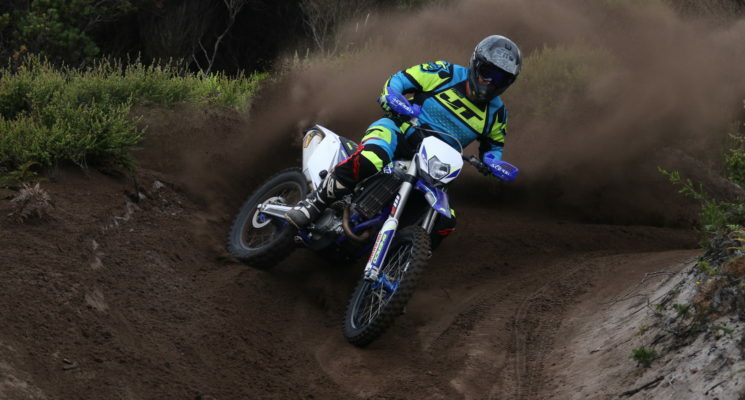 Air filters using fft was definitely the choice in dusty conditions! Can you tell me the brand and tyres of filter used? I’ll use this for linking to it’s website. Running the Shinko 546 series all week was a good choice! Doing 250km each day tested tyres. Seeing a lot of others having issues with their tyres. Got questioned a lot of my tyres and told them exactly what I thought! They proved their quality of lasting in hard conditions and hooked up all week long! Changing tyres each night was no hassle either. These tyres are nice to fit and have a strong bead unlike some! Racing was good but not what I wished. 20 seconds off pace in a 12min sprint loop isn’t what I wanted. With 3 from 4 7th places and one lap stopping for an injured mate and getting him help I’ve settled for an 8th outright for the season opener. The seasons long but hoping to bounce back. Stopping for an injured mate is just instinct and sportsman ship. You never want to see a mate hurting so much and blood coming out of his mouth. He’s very lucky as he has a smashed collarbone, collapsed lung, broken vertebrae, bruised lung, and 3 broken ribs. I’d rather get recognition for helping someone rather than winning for not stopping! Onwards and upwards for rest of season!! 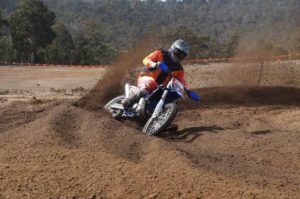 Had my first race meeting a week ago, Hot dusty grass track. 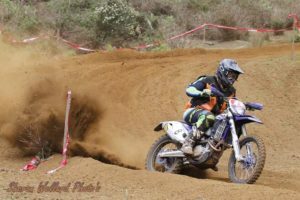 Entering in all powers A grade and pro open on my little Sherco 300! Running a 540 front and 505 CHEATER Rear which I’ve trained on for near 6 months now! A lot of banter went around the pits cause of my tyre condition but I did it to prove something. Pulling hole shots and getting my class wins on the day and getting a head start to kick-start these 3 championships I’m chasing down this year down south! So, proved a lot of people wrong using this tyre and it hooked up perfect all day!